The true college experience doesn’t happen just in the classroom. It happens on your way to Ruth’s Marketplace with your friends. It happens during a study session with your floormates. It happens while you’re up late having a heart-to-heart with your roommate. It’s what happens when you live on campus. That’s why St. Norbert offers a four-year residential college experience. 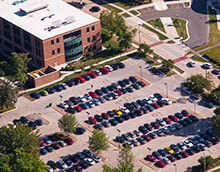 Residential Education and Housing provides many types of housing to meet student needs, including an all-women hall, coed halls, suite-style living arrangements, apartments, townhouses and houses. We even have halls dedicated to community service initiatives, the Honors Program and global communities. When you first enroll at St. Norbert, you will be assigned to one of our first-year student housing options. As you progress through your four years here, you will have increasingly independent options such as townhouses, apartments or college-owned houses. No matter which hall you live in during your first year, we think you’ll quickly feel at home on our small, friendly campus. You’ll find there are plenty of opportunities to nurture friendships, learn, develop and explore. First-year housing options include: Bergstrom Hall, Madelaine/Lorraine Hall, Mary Minahan McCormick Hall (some floors) and Sensenbrenner Hall. Mary Minahan McCormick Hall can be assigned to first, second, third and fourth year students. All first year residential students are required to have the Platinum (unlimited) Meal Plan. We begin processing housing assignments for first-year students after summer orientation in June. It’s the moment you’ve been waiting for! We’ve prepared a list of what items you should bring with you when you make the move to campus in August. And, we’ve included a list of a few things you’ll want to leave at home. First-year students are expected to be familiar with the housing policies before the start of the academic year. Policies include the housing agreement, residency requirement and residential living guidelines. Mid-July: Final housing assignments and roommate information notices are sent via SNC email. Not everyone lives on campus when they go off to college. Commuter students are students who commute from their primary parent/legal guardian's home address within 35 mile of the college campus. Do you and your roommate want extra space in your residence hall room? Meet other students who want to improve the on-campus living experience by joining the Residence Hall Association, National Residence Hall Honorary or your Hall Council.